Bognor are back in the Bostik premier top five after coming from 1-0 down at half-time to win 3-1 away to Corinthian Casuals. Hamilton Antonio gave Casuals a tenth-minute lead but another double by Jimmy Muitt, who is now the top scorer in the league, helped the Rocks claim the three points. Muitt tucked away a penalty on the hour to give Bognor the lead after Tommy Scutt - who had replaced Josh McCormick at the start of the second half - had equalised five minutes earlier. Muitt made sure of the win with a late third for the visitors, who move back up to fifth, ten points behind leaders Dorking. Bognor host Tonbridge next Saturday. 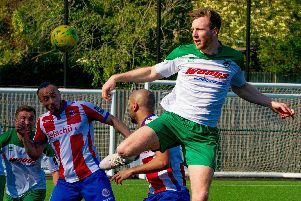 In the Southern Combination premier, Chichester City - like Bognor - had a second-half comeback to thank for a 2-1 win at Broadbridge Heath. George Cousins put Heath ahead on 16 minutes but it was Scott Jones on 55 minutes and Josh Clack on 90 who earned City a win that leaves them two points clear at the top, with closest rivals Newhaven only drawing at Little Common. Pagham put six past Loxwood at Nyetimber Lane, despite it being goalless after an hour. Harry Prisk led the way with a 24-minute hat-trick, Liam Brady got two and Howard Neighbour the other as the Lions racked up their best win in a while. In division one, Selsey won 2-0 at Seaford and Sidlesham had a Jonathan Fryatt goal to credit for their 1-0 success at Southwick. Midhurst went down 5-2 at Wick with Liam Dreckmann and Callum Coker on target. In division two Bosham slipped up 2-1 at Rottingdean, Ryan Coombes their scorer. West Sussex League results included a 2-0 defeat for Felpham Colts against Whyke, the same loss for East Dean against Predators and a 1-1 draw for Lavant against Angmering. In rugby, Chichester had a superb 42-21 bonus-point win at Dartford in London one south while Bognor were just as impressive in a 39-13 home win over Fordingbridge.